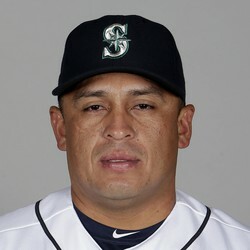 Carlos Ruiz went 2-for 3, hitting a solo-shot and a double in Seattle's 10-2 drubbing of Oakland on Sunday. After an 0-for-13 slump over six games, Ruiz has now gone 4-for-7 in his last two games with two home runs and two RBIs. Manager Scott Servais gave the veteran backstop a breather in the ninth inning, allowing catcher Mike Marjama to make his Major League debut. Ruiz playing time is limited (he has appeared in only 46 games this year) and thus he offers little fantasy value other than a cheap play in daily formats.